The following group types are not accepted by this hostel: Business Trip, Sports Group If you have misrepresented the type of group you are booking for, your booking may be cancelled by the hostel." 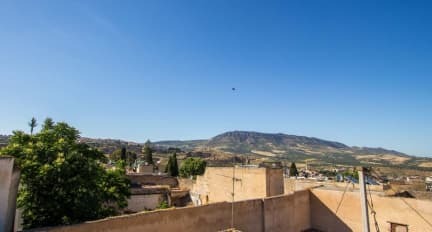 An Authentic Riad in Fez which offers Arabic comfort, and access to everything which can be expected of the cultural and spiritual capital of Morocco. Welcome to Dar Akram Fez. Come to Fez to be enchanted by the historic Medina. Staying in a traditional Riad is simply the best way to do that. The location of the Riad is ideal, situated next to the famous Gate (The Blue Gate) and next to the main square 'Batha'. It is easy to enter the Medina or take a cab to ‘La Ville’ (the new center.) The Riad is also nearby popular monuments including the Medrasa Bounania , Kairaouine Mosque and University of Al-Karaouine. Charming bazaars and souks are found all over. We offer you a variety of comfortable intimate rooms with an authentic oriental character. 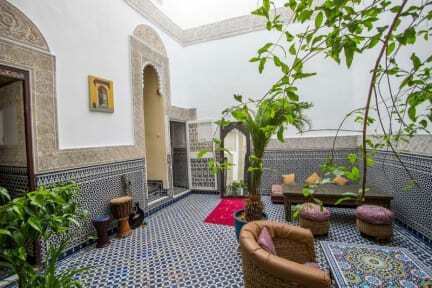 It is also possible to rent the entire Riad. Dar Akram offers rooms come with a closet. The rooms include a shared bathroom, while certain rooms include a patio and others also have a mountain view. We are pleased to welcome you to our Riad in Fes, enjoy the Moroccan hospitality! Our team is on site 24/7 to help you to fully enjoy your stay. Pets can't be hosted in our place. Tours and Excursions can be organized on request. Shuffle to/From airport cost 15 Euros for two people.